What a great story of determination, faith and courage. His professionalism, patriotism and character were impeccable. I would highly recommend him! We intended to honor those who serve our country and Steve couldn't have been a better choice. Steve Russell did an outstanding job at our Community Leaders Prayer Breakfast. Our Congressman went out of his way to rave about the presentation. Thanks for your help in making this a very successful event. 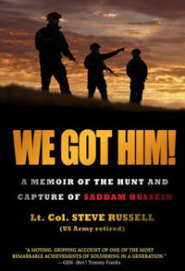 Recently we had Col. Steve Russell to tell his story during a major event at First Redeemer Church. Out of all the guests, he is the one speaker that the people wanted us to bring back as soon as possible. I highly recommend him! Steve did an incredible job! Not only was he a great communicator on the stage, he was extremely gracious to speak with people afterwards. We are honored he came and appreciate his love for God and his desire to see people come to faith in Christ! "Steve was a tremendous blessing to our fellowship. He is a class act and a true patriot. He is an awesome speaker and has a compelling message. His message goes much deeper than the mere capture of Saddam. He is a Christian and a Patriot, a soldier and a family man...We highly recommend him. He can stand in many arenas with intelligence and power. Truly inspiring! Makes us proud to be an American, and proud of the caliber of our fighting men on the front lines fight terror." Steve Russell did an outstanding job at our Community Leaders Prayer Breakfast. We have received numerous comments, verbal and written on the outstanding job he did. "Wonderful, inspiring, the best program yet, he change my life" are some that come to mind. Our County Sheriff said it was "over the top." Our Congressman went out of his way to rave about the presentation.